Is the pen mightier than the sword? Probably not, but the mobile device might be. 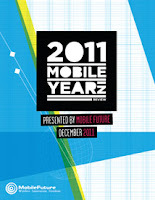 2011 wasn't just the year of mobile, it was the year that mobile took over the world, as they say in this video, along with some mind blowing stats. Exciting growth in 2011 and another awesome video following last years.